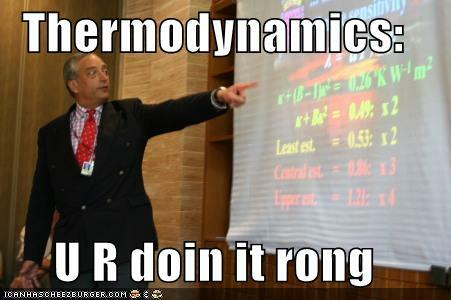 The Second Freaking Law of Thermodynamics! The only thing that cheeses off sci-fi fanboys more is Albert "No FTL for You" Einstein. Thermodynamics gets the the goat of not one but two sets of sci-fi-guys, when it tells them You Can't Do That. Group Primus is highly urinated because they can't have Run Silent, Run Deep in outer space because the heat of your shivering body can be spotted at a range of one hundred times the distance between Terra and Luna. Group Secundis is highly urinated because heat radiators give their macho space warships a big fat glass jaw. Neither group can seem to get it through their heads that attempting to avoid a scientific law is like letting go of an anvil over your foot and daring the law of gravity to start something. Especially when your main motive is to see your favorite unscientific media science fiction show somehow happen in real life. For a more in-depth analysis of the impact of thermodynamics on your science-fictional universe, obtain and read Ken Burnside's The Hot Equations: Thermodynamics and Military SF. Now in some subsequent pages in this website, there will be unpalatable scientific truths. But of them all, there are two in particular that give me more hate mail than all the rest put together. The fact that there ain't no stealth in space, and the heat radiator "Achilles Heel". Both problems are caused by heat. In one case, it is the waste heat of a spacecraft that becomes a stealth-destroying beacon. In the other, it is the fragile nature of heat radiators. About once a month, I get an email from some eager fan who believes they have the miracle solution to both problems. "Eureka! I've got it! All you have to do is use the Peltier-Seebeck effect to convert the heat into electricity! Then you can store it or use it as is convenient. A simple thermocouple and the problem is gone!" This solution is elegant, marvelous — and totally wrong. People who come up with this are to be congratulated on their brainpower, but they need to study their physics a bit closer. What's the problem? 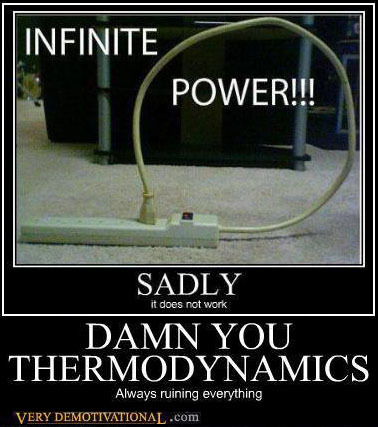 Well, the general problem is that pesky Second Law of Thermodynamics. In this context, it tells you that it is impossible to destroy heat, the best you can do is move it around. So using a thermocouple to convert heat into electricity is impossible. The specific problem is that a thermocouple does NOT convert heat into electricity. It converts a heat gradient into electricity. The original heat is still there. In fact, the conversion process adds even more waste heat to the original total. As an analogy, think about a hydroelectric dam. The water in the reservoir is at a higher gravity gradient than the water downstream. The hydroelectric dam converts the gravity gradient into electricity. But the water is still there after passing through. The dam does not convert water into electricity, if it did the water would disappear. In the same way a thermocouple does not convert heat into electricity, the heat is still there. Using useful energy creates heat. You can't get rid of this heat; you can only move it around. You can in some cases use differences in temperature (i.e., heat) to generate useful energy, but it also generates even more heat. That can be helpful if you have somewhere to dump the heat, but if your problem is that you have a lot of heat and need to get rid of it, that doesn't fix your problem; it only makes it worse. Peltier devices only make electricity by using a heat gradient. They get power by moving heat from an area of high heat to an area of low heat. They don't get rid of heat, they just move it around. Once the gradient is collapsed, no more electricty can be generated. The thermoelectric effect converts a temperature difference into electricity; like all heat engines, it does not work if no temperature difference exists. In addition, like all heat engines, only a portion of the heat is converted into energy; the remaining heat is conducted from the heat source to the heat sink; specifically, like all heat engines, the upper limit on conversion efficiency is equal to the temperature change divided by the initial temperature. In order to keep producing power, you must keep the heat sink cooler than the heat source. To keep the heat sink cooler, you must either refrigerate it (which consumes more power than is generated by the thermoelectric effect) or you must run a radiator at the temperature of the heat sink. If the heat sink is reasonably cool, this radiator will be extremely large. Heat, by definition, is energy that comes with associated entropy. It is a well verified physical law that entropy cannot be destroyed, it can be created but the only way to decrease your amount of entropy is to move it somewhere else. To avoid having entropy build up on your spacecraft until something breaks, you need to get rid of it by moving it off the craft. The thermoelectric effect (Seebeck effect, Peltier effect, Thompson effect) moves heat through a device -- meaning it moves both energy and entropy. Some of the energy is shunted aside as entropy-free electric work that you can use for doing other things, but the remaining energy still has at least as much (and probably more) entropy with it. You have just moved the problem around, not gotten rid of any of it. In fact, in doing this, you made it harder to get rid of that entropy. To explain why requires a bit of simple math. If you transfer an amount of heat Q at constant temperature T, the entropy S that moves along with the heat is S=Q/T. If you take in the heat energy Q_h and entropy S at a high temperature T_h, you can get rid of the entropy at low temperature T_l with less associated heat energy Q_l = S * T_l < S * T_h = Q_h. All the remaining energy Q_h - Q_l is entropy free, and you can use it for other things. To get rid of the entropy now at T_l, however, you can only discharge it into something even colder (or do work to move it someplace warmer). This is how all heat engines work, from gas turbines to automotive piston engines to Peltier or Seebeck thermocouples. On a spacecraft, the only way you can move energy and entropy off the spacecraft is by putting it in something else and ejecting that something else, or radiating it away as electromagnetic waves. Since trying to put all your entropy in matter and dumping it is wasteful for your mass budget, radiation is the usual trick. However, the required radiator area scales as 1/temperature to the fourth power. The colder you are storing your entropy, the larger the radiator you need to get rid of it, and the size increases very rapidly with decreasing temperature. Using a thermocouple to extract electricity means you end up with lower temperature entropy and thus need even larger radiators to get rid of it. If someone points out to you that your pet theory of the universe is in disagreement with Maxwell’s equations—then so much the worse for Maxwell’s equations. If it is found to be contradicted by observation—well these experimentalists do bungle things sometimes. But if your theory is found to be against the second law of thermodynamics I can give you no hope; there is nothing for it but to collapse in deepest humiliation. Nature prefers the more probable states to the less probable because in nature processes take place in the direction of greater probability. Heat goes from a body at higher temperature to a body at lower temperature because the state of equal temperature distribution is more probable than a state of unequal temperature distribution. There is only one law of Nature—the second law of thermodynamics—which recognises a distinction between past and future more profound than the difference of plus and minus. It stands aloof from all the rest. ... It opens up a new province of knowledge, namely, the study of organisation; and it is in connection with organisation that a direction of time-flow and a distinction between doing and undoing appears for the first time. It will be noticed that the fundamental theorem proved above bears some remarkable resemblances to the second law of thermodynamics. Both are properties of populations, or aggregates, true irrespective of the nature of the units which compose them; both are statistical laws; each requires the constant increase of a measurable quantity, in the one case the entropy of a physical system and in the other the fitness, measured by m, of a biological population. 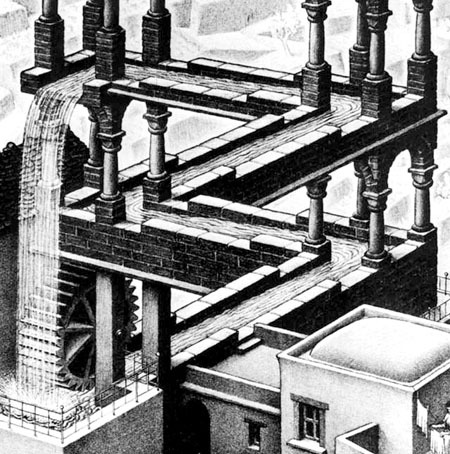 As in the physical world we can conceive the theoretical systems in which dissipative forces are wholly absent, and in which the entropy consequently remains constant, so we can conceive, though we need not expect to find, biological populations in which the genetic variance is absolutely zero, and in which fitness does not increase. Professor Eddington has recently remarked that “The law that entropy always increases—the second law of thermodynamics—holds, I think, the supreme position among the laws of nature.” It is not a little instructive that so similar a law should hold the supreme position among the biological sciences. While it is possible that both may ultimately be absorbed by some more general principle, for the present we should note that the laws as they stand present profound differences—-(1) The systems considered in thermodynamics are permanent; species on the contrary are liable to extinction, although biological improvement must be expected to occur up to the end of their existence. (2) Fitness, although measured by a uniform method, is qualitatively different for every different organism, whereas entropy, like temperature, is taken to have the same meaning for all physical systems. (3) Fitness may be increased or decreased by changes in the environment, without reacting quantitatively upon that environment. (4) Entropy changes are exceptional in the physical world in being irreversible, while irreversible evolutionary changes form no exception among biological phenomena. Finally, (5) entropy changes lead to a progressive disorganization of the physical world, at least from the human standpoint of the utilization of energy, while evolutionary changes are generally recognized as producing progressively higher organization in the organic world. You can't win, you can only break even. You can never reach absolute zero.